The climate of the Roman period from 200 BC to 100 AD is considered fairly close to ours, with a cooler period before that and after that (see Ancient Climate/Temperature). Hence, and in the absence of further proof, we usually suppose that the ancient wave climate is similar to the present one. Waves are generated offshore by friction of the wind on the sea surface (such waves are called ‘wind waves’). Waves travel on the sea surface over hundreds (even thousands) of kilometres after they were generated (such waves are called ‘swell’). When they reach the coastal shallow waters, they change in height and in direction due to shoaling, refraction and diffraction effects. Modern design of coastal structures exposed to wave attack is based on a sound knowledge of the local wave climate. Wave generation and propagation are complex processes and statistics play an important role in the description of the wave climate in a given coastal location. A simple way to define a sea state is to mention its ‘significant wave height Hs’ which is defined as the average of the one third highest waves of that sea state. This Hs is considered to be close to the visual estimate which would be given by an experienced observer of the sea. Design of coastal structures is based on the principle of ‘accepting a certain level of damage to the structure, for a certain probability of occurrence of the waves’. One could indeed accept a lot of damage for a very rare event, or very little damage for a more frequent event. For modern coastal structures, it is usually accepted to have very little damage for a one in hundred years storm event. Hence, coastal engineers will speak about the ‘1 in 100 years Hs’ to define the design wave conditions. Assuming an average of 10 ‘big’ storms per year (which leads to 1000 storms over 100 years), this means that the design storm is the largest storm in this series of 1000 and therefore has a probability of occurrence of around 10-3, that is 0.1%, in a given year … this seems not much … However, the probability of occurrence of a ‘1 in 100 years’ super storm during your lifetime of say 75 years, is around 53% … quite a high chance (nearly one in two) that you will witness this super storm, that is supposed to generate ‘very little damage’. As they usually do not have wave measurements over 100 years, coastal engineers use a computational approach (called hindcasting) to generate wave data over a period of say 20-30 years, they perform a ‘Peak Over Threshold’ analysis of the largest storms and they extrapolate this data to provide an estimate of the 100-year storm (see Mazas & Hamm, 2011). 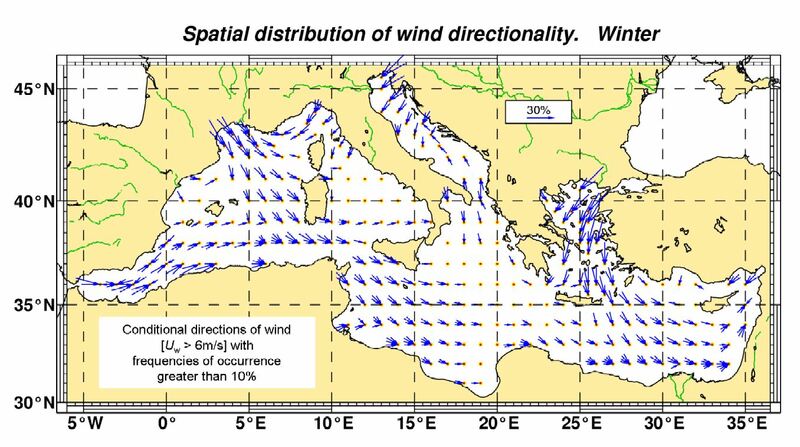 Let us now go back to the Mediterranean Sea where we know that winds blow from North and NW most of the year. 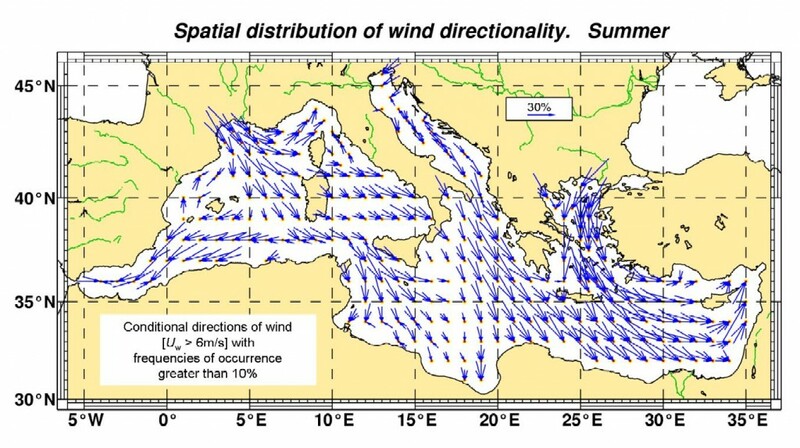 Data taken from the Wind and Waves Atlas of the Mediterranean Sea (2004) show this effect in more detail. The pictures can be downloaded in higher definition (use “save as”). 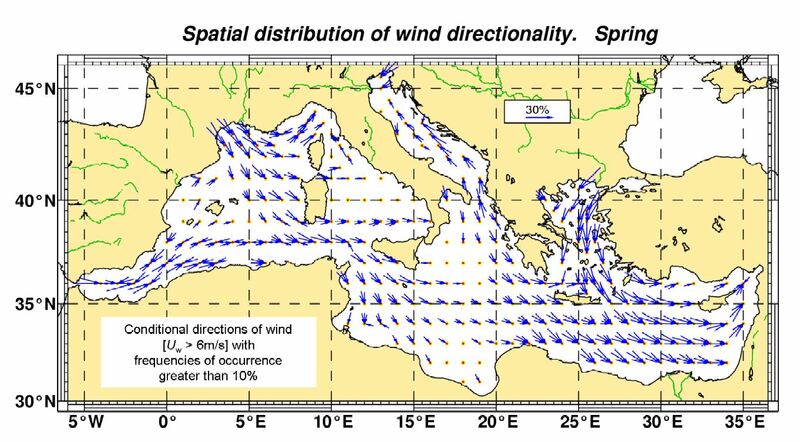 These pictures show the strong summer winds from NW: the Tramontane and Mistral in France, The Bora in the Adriatic and the Meltem in the Egean. They reduce somewhat in autumn, but this would be more obvious on monthly charts instead of the above seasonal charts. These winds induce waves travelling on the sea from NW to SE, towards the African coasts. For this reason the East coasts of Spain, Corsica-Sardinia, Italy-Sicily, Tunisia, and Greece are relatively less exposed to large waves than the North coasts of Algeria, Tunisia, Cyrenaica-Egypt. Note that places with reduced exposure to waves are safe for coastal structures; these places may still be exposed to strong land winds, which is not safe at all for navigation as ships are taken away offshore by the wind where they will finally encounter large waves. Results are based on 30-year long simulations of the wind wave field in the Mediterranean Sea carried out with the WAM model. The wave model has been forced by the wind field computed by the RegCM regional climate model at a 50 km resolution. The results are shown as a 5% exceedance significant wave height which is exceeded during 5% of the time, that is around 2 weeks/year. Depending on the area, this wave heights near the coastlines range from 1 to 4 m, with the highest values along the North-African coasts. The design wave heights for coastal structures are obviously larger. Depending on local wave statistics, the design wave height is a factor 2 to 2.5 times larger than the above mentioned 5% exceedance significant wave height, leading to Hs = 10 m in areas exposed to offshore waves. The wave heights are shown for deep water (say over 100 m) and it must be stressed again that waves change in height and in direction from this limit up to the coastline where they will ultimately break due to the shoaling sea bed. A first approach is to say that waves break when their height is around 0.6 times the local water depth, e.g. a wave with significant height Hs = 6 m will break on a water depth h = 10 m. Hence, if an ancient breakwater was built in 5 m water depth, the largest Hs reaching the structure would have been 3 m. Storms with Hs = 3 m are numerous. For a modern breakwater built in 20 m water depth, the largest Hs reaching the structure is 12 m which is a fairly large value that corresponds to exceptional storms in the Mediterranean Sea (less exceptional in the Atlantic). So do not use the map above for the design of your next breakwater! Just use it to realize that some areas are more subject to severe wave attack than others. ARNAUD, P., 2005, “Les routes de la navigation antique”, éd. Errance, 248 p.
ARNAUD, P., 2014, “Marseille grecque et les routes du commerce maritime”, in “Les territoires de Marseille antique”, Arles, Paris, éd. Errance, p 185-213. CIRIA, CUR, CETMEF, 2007, “Rock Manual – The use of rock in hydraulic engineering”, (2nd edition), ed. C683, CIRIA, London, 1304 p.
DE GRAAUW, A., 1986, “Wave statistics based on ship’s observations”, Elsevier, Coastal Engineering, 10, p 105-118. 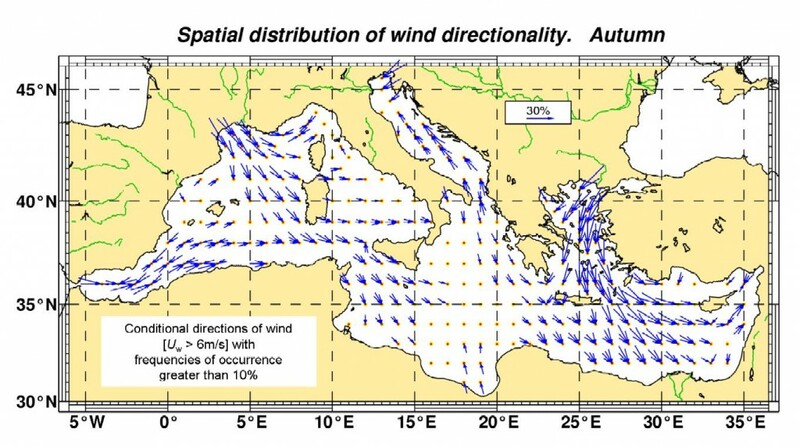 GALANIS, G. et al., 2011, “Wave height characteristics in the Mediterranean Sea by means of numerical modeling, satellite data, statistical and geometrical techniques”, Mar Geophys Res, Springer Science+Business Media BV, 2011. GODA, Y. 2010, “Reanalysis of regular and random breaking wave statistics”, Coastal Engineering Journal, Japan, Vol. 52, No. 1, p 71–106. LIONELLO P. and A. SANNA 2005, “Mediterranean wave climate variability and its links with NAO and Indian Monsoon Clim. Dyn.”, 25, pp 611-623. 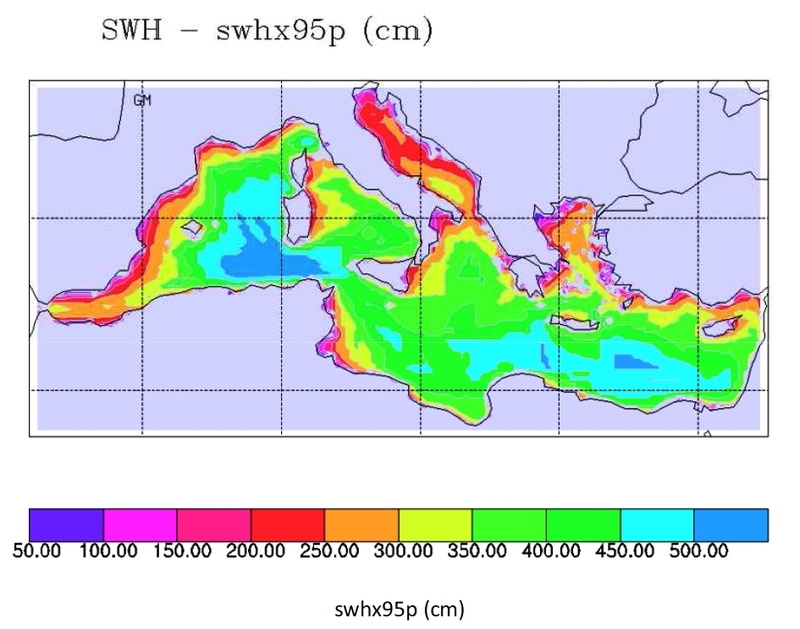 See also: Regional wave climate projection studies in the Mediterranean Sea (2011). MAZAS, F. and HAMM, L., 2011, “A multi-distribution approach to POT methods for determining extreme wave heights”, Coastal Engineering, 58, 2011, pp 385–394. WESTERN EUROPEAN UNION 2004, “Wind and Waves Atlas of the Mediterranean Sea”, ed. Western European Armaments Organisation Research Cell, 386 p.